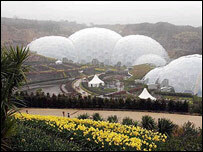 Final preparations are under way at Cornwall's Eden Project for the Live 8 concert to be held there on Saturday. The Africa Calling show was announced amid criticism that Live 8, which aims to highlight world poverty, featured too few black artists. 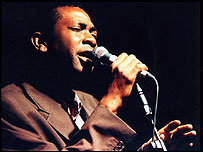 A host of African artists are performing at Eden, including Senegalese singer Youssou N'Dour. N'Dour is aiming to perform in London, Paris and Cornwall all on the same day. Peter Gabriel will compere the show. Somalian singer Maryam Mursal and vocalist Angelique Kidjo from Benin, will also be performing, along with Thomas Mapfumo, Akim El Sikameya, Angelique Kidjo, and Senegal group Daara J.
Gabriel, co-founder of the word music body Womad, explained the Eden Project concert would give African artists an opportunity to be heard. He said: "We have a chance to do more to redress the balance. Africa Calling will be about voices of Africa undiluted. "I think there are advantages from separating it, although it wouldn't have been my first choice." Eden's chief executive, Tim Smit, said he hoped to create "an authentic voice for Africa that was moving and personal". He added: "We want people to come along and say 'I was there and I will remember it until the day I die'." BBC Radio 3 will broadcast from the event as part of the Live 8 coverage. The whole Africa Calling event will also broadcast live on the BBC Cornwall website from 1300 BST to midnight on Saturday. How did London stars do? Were you at a Live 8 concert?